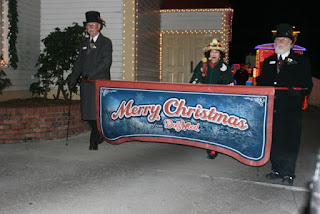 Dollywood at Christmas time. The fill the park full of lights and have a Light Parade every night. The park has 10 different shows that occur through out the day in different theaters. Sunshine and I, along with a good friend, attended 5 of them. The Christmas on Ice skate show was excellent. The group that performed was from New York City. There was Christmas in the Smokies and O Holy Night. We enjoyed every one of the shows. There are live performers, singers, actors, and skaters. There were lots of kids in the park while we we there and they were all excited. The best part is they do not shy away from telling everyone that Christmas is about the birth of our Lord and Savior Jesus Christ. There are not many places you can go today to enjoy the true Christmas story and this was a welcome change of pace. Now I live in northern Virginia, and Dollywood is in eastern Tennessee, somehow Sunshine was able to talk me into buying season tickets. So we will be returning, probably not before Christmas, but returning none the less. Have a great day and Merry Christmas!! !